We are a Christian homeschooling family with a vision to share the Truth found in God's Word with others. In 2009, we prayerfully took up the task of making our first film, Children are a Blessing. Since then, we have produced four more films. Our hope is that God would use these films as tools in His hands, to work in the hearts and minds of His people. We pray that your family is encouraged. We'd love to hear from you! I went to count the number of blessings you had and almost mistook the mum as being one of her children! She looks very young! Having children certainly agrees with her! You are so kind! I agree that having lots of children does make one continue to feel young! I am interested in your new film about learning Bible Verses. Which version of the Bible are you using? Thank you for your interest. We're using the King James Version. http://www.headcoveringmovement.com/ ? Great site, with a reformed view. Thank you so much for the encouragement. To God be the glory! We are thankful that He uses such undeserving and imperfect vessels to promote His truths. I have not heard of this particular head covering site to my knowledge. You have a lovely family! What are the names and ages? My husband and I have enjoyed these films so much. Truly a blessing to our family. I would love to know what curriculum you use for your children, looking forward to homeschooling in our future. To God be the Glory! Hi Stephanie! We're so thankful that you've enjoyed the films! Thanks for taking the time to let us know. For a number of years, our family has used Christian Light Education as our basic curriculum. Though we aren't Mennonite (and therefore would not agree with everything), we have found the material to be both beneficial and enjoyable. We also use a variety of other educational tools, including wonderful creation-based science resources from Answers in Genesis. We also find that daily life on a farm itself lends to many learning experiences for the whole family. We want to encourage you in your decision to home school in the future. You'll be so thankful you did! I wanted to thank you for producing such wonderful films. Our family has truly enjoyed watching them. I would be interested to hear if you have any more "It is your life" in the works? How about in Texas? My husband and our family would like to see like minded families in our state. Love your family and the Moody's and Moss's. I am just wondering if there is an update on the Moody family and their move to Virginia. would love to hear more about their move and if they have had anymore blessings added to their tribe! Hello! Thanks for asking about the Moody's. Actually, they are expecting their 8th little blessing any day now! 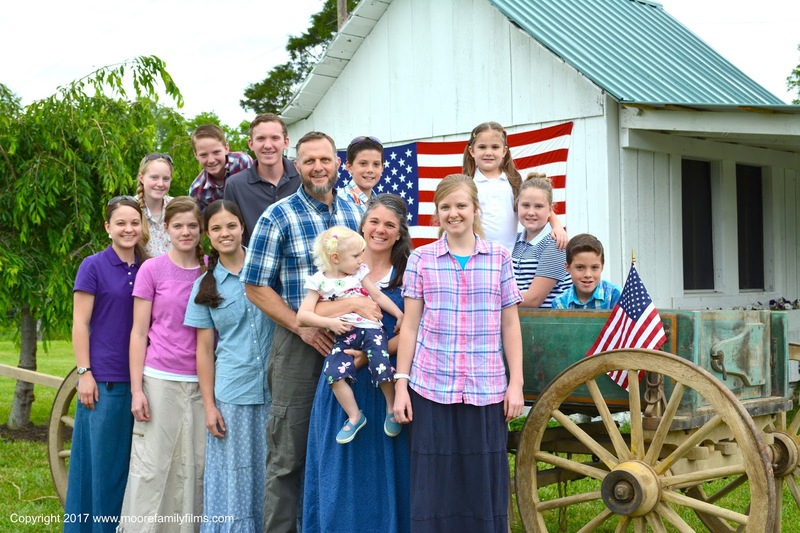 They've settled into their farmhouse very nicely, and are staying busy milking their cow and raising some meat chickens, along with continuing to raise their children for the glory of God! Hi Theresa! Thank you for your order. As you probably noticed, we used your comment in a recent e-mail promoting the sale of the It Is Your Life films. No definite plans for more films, but we are prayerfully considering how the Lord would use us. Possibly another film? Whatever would bring Him glory! We would appreciate your prayers! Thank you for taking the time to encourage us. We appreciate it! I just ordered another set of the It's Your Life DVDs. Thank you for such wonderful films. Our Moore Family Films DVDs have been making their way around our church family for months now and we miss watching them!!! I hope their is another It's Your Life film in the making... we enjoy them so much. Thank you for the encouragement! And we are grateful to the Lord for giving you the generosity to share your films with your church family! We, too, like to share resources that the Lord has used to teach our family. No film is in the making at the moment, but we are listening to feedback and prayerfully seeking the Lord's will in the matter. Thank you for taking the time to be in touch! What a rarity and wonderful blessing to see such a beautiful and godly family raising children to love and honor our Lord Jesus Christ. Thank you for your ministry and know that the Lord has used your films in a mighty way in our family. We are fairly new believers and after viewing your films our hearts have been turned toward our home and children! Praise God! If time allows I have a question for Mrs Moore : what would you say are the 3 most important things to teach little ones ages 3.5, 2, and 2 months old? Also you speak of training children in righteousness in your "Children are a blessing video", can you recommend any books, resources, materials that will help me do just that. Thank you from the bottom of our hearts. May the Lord bless you in all that you do for Him! Karolina, I apologize for the delay in responding to you. Actually, I replied by email months ago, but it bounced back. I'm just now copying and pasting my email to you below (in several different replies due to the lack of space). Hi Karolina! Thank you for leaving a comment on our site! As a busy mom, I know that was a sacrifice of your time! Your words of encouragement were a blessing to us. Praise the Lord for the work He is doing in your family's hearts! How exciting! He will continue to do a work as you trust in Him and steadfastly keep the course. I've thought quite a bit about the 3 most important things to teach little ones. That's a great question! I would have to answer the way Jesus answered his disciples when they asked what the greatest commandment is. I would say, first, teach your children to love the Lord with all their hearts, soul, minds, and strength. We pray that the Lord will draw our children unto salvation at a young age, and we teach them and pray with them about this often. Then, we teach them that if we love the Lord, we will obey Him (John 14:15). Our obedience does not save us, but we are saved unto good works (Eph. 2:10). So, they can practice obeying the Lord by obeying His specific commands to children, which are to obey and honor their parents. We pray that all they do will eventually flow from a heart of love toward their heavenly Father. I'm having trouble pin-pointing a third, in order of importance. So, I will just mention some other things we feel are very important to teach our children. "Obey the first time, every time, with a smile on your face and heart." I think it's important to require small children to obey instantly with a good attitude. A good attitude is important. It's not acceptable to teach them to just obey, but to learn to obey cheerfully. The way we teach them to obey us is how they'll eventually learn to obey God. Also, teach them to value hard work and to do even the small tasks thoroughly - "quickly and efficiently" we say. When they are faithful in the smaller tasks, they "graduate" to large tasks, which they're usually pretty excited about (Matt. 25:21). I think it's so good also to teach them to serve others - beginning in their family, and then looking for opportunities to serve those outside the family. This keeps their minds off themselves and on others. It may be as simple as making a get well card for someone in their church or helping you make cookies for a neighbor or elderly shut-in. We try to instill the importance of daily Bible reading and prayer from an early age. They will learn this by our example. When they see Mommie and Daddy reading God's Word each day, and as we read God's Word to them daily, they will learn to value that time for themselves. Of course, we also teach them the value of memorizing Scripture, and we find that we all do this best when we memorize verses and even passages as a family (Ps. 119:11). You are a wise Mama to be seeking advice for training your little children. What a blessed stage you are in! It will fly by! As for resources, I would encourage you to check out our "Our Favorites" page if you haven't already. Also, I would encourage you to home educate your children using a Biblical curriculum that glorifies the Lord in every subject. We use Christian Light Education, but I'm sure there are many others. With our young children, we've also enjoyed The Moody Family series of books by Sarah Maxwell (check out Titus2.com), good Creation-based resources from Answers in Genesis, as well as the films on "Our Favorites." There is a video series called "Raising Godly Children in an Ungodly World" by the Bradford Family that we found very insightful and helpful a number of years ago as well. I hope I've helped in some small way. I feel that I'm forgetting great resources and advice! But, as you seek the Lord and His Word for training your children, HE is faithful to lead and teach you along the way. I pray that He does just that. Thank you again for being in touch and for encouraging us. If we can ever be of any help, please let us know. May the Lord mightily bless you and your husband as you raise your children for His glory! Correction to one of the resources mentioned in the above comment: Raising Godly Children in an Ungodly World is by the Bradrick Family, not Bradford. We apologize! Your Family is such a blessing! I enjoy your movies a lot and have almost worn mine out! Are you planning on making anymore films? HI Susannah! Thank you for being in touch. We praise the Lord that you have enjoyed our films - all glory to Him! As for making more, we are prayering about that. If the Lord so leads, we would be grateful to have you join us in praying for His will. If He wants us to make more films, we pray that He will strongly impress that on our hearts and provide all the means and tools for the task. Although we've greatly enjoyed making the films we've produced so far, it is a major time and financial commitment, and we must depend entirely on the Lord for His provision and guidance. Thank you for asking, and thanks in advance for any prayers on our behalf!! I feel such sadness. My desire was to live a life as you are doing. We had land, animals, gardens, and homeschooled. But I now find myself a single mother of 4 living in a suburb and kids attend a Christian school. I feel like I can't raise the kids the way I desire. I would love a DVD on how someone in my situation could live that glorifies God. It's a blessing to hear from you! We read every comment and are thankful that you'd take time out of your busy schedule to contact us! As much as we'd love to correspond with each person who contacts us, most of the time it just isn't possible. Like you, our first responsibility before the Lord is our ministry to our own family and church. That said, from time to time, we do set aside some time to respond as the Lord leads. If you have a problem downloading a film, if your DVD is damaged, if your order is incorrect, or if you have a question regarding an order, we will get back with you as soon as possible. Don't hesitate to contact us! We just ask that you please be patient with us as we try to conduct a ministry/business out of our home while farming and raising a family. We're sure you understand! Sign up for our e-mail list to get occasional updates and sale notifications! Tried, true, and affordable Christian alternative to secular insurance! Join today and tell them that Shane and Edee Moore sent you! Our family is thankful to be members and hope that you will consider joining as well. Our family has been members of Samaritan Ministries since 2008. We are so pleased with it and only wish we had joined sooner! So far, Samaritan Ministries members have paid for 100% of our home births, several thousand dollars toward our daughter's medical bills when she experienced viral myocarditis, several trips to ER, and the majority of 22 very expensive stitches in our oldest son's finger! Each time we receive a check in the mail, there's also a note of encouragement from members who have been praying for us. We have even received small gifts, poems, and words of testimony of God's faithfulness after several miscarriages. This is a "bill" that we actually enjoy paying each month as we prayerfully write a check and send a note to a fellow member with a medical expense. As we tell others, Samaritan Ministries is one of those rare things in life that may sound too good to be true but is!! And the very best part is knowing that our money is going straight to a fellow believer with a real need and not toward unbiblical procedures!! We thank God for this ministry. Check it out at SamaritanMinistries.org. Tell them Shane and Edee Moore sent you! If you need further testimony of God's faithfulness through Samaritan Ministries, we'd love to talk with you. Just contact us! © 2014 Moore Family Films. All rights reserved.